Translated from the Spanish This translation originally published: New York: Penguin Books. ***NOW A BESTSELLER: `I read it and it's bewitched me ever since. I'm spellbound' - Chris Evans***We all have an ikigai. Even if we don't know it yet. Ikigai translates as `a reason to live' or `a reason to jump out of bed in the morning'. It's the place where your needs, desires, ambitions, and satisfaction meet: a point of perfect balance, and perfect fulfilment. On the Japanese island of Okinawa, people live longer than anywhere else in the world. 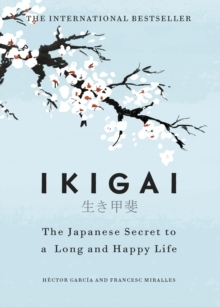 There, finding your ikigai is considered the key to longevity - and to happiness. The Okinawans know that all lives are valuable; for them, your ikigai is the lens that will help bring your value into focus. Both inspiring and comforting, this book will help you uncover your own ikigai, and equip you to change your life. Leave stress and urgency behind, and throw yourself into finding your purpose, nurturing your friendships, and pursuing your passions. Make every day of your life joyful and meaningful with Ikigai. ______________________________'Ikigai gently unlocks simple secrets we can all use to live long, meaningful, happy lives. Science-based studies weave beautifully into honest, straight-talking conversation you won't be able to put down.